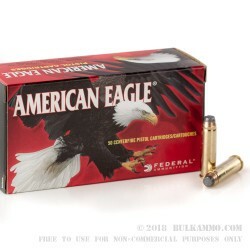 Representing an incredible value in bulk .357 Magnum ammunition, not only is this a great price for range ammunition, it’s a steal for personal defense ammunition. Federal has proven reliable with this .357 Magnum load has proven itself to be over many years. The jacketed soft point projectile offers great ballistics, and makes this an easy choice over other range ammunition because it simply performs day in and day out. A classic cartridge build, the semi jacketed soft point is the quintessential .357 Magnum projectile, and offers double duty to those shooters who want more than just another cheap shooting round. 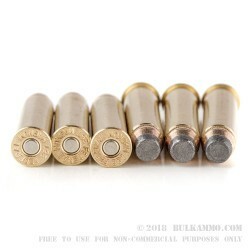 This round is capable of the same stopping power that originally made the .357 famous and delivers a manufacturer reported muzzle velocity of 1240 feet per second. The American Eagle line by Federal is just a great value line in general. A stalwart in that line being the .357 Magnum, which can easily be purchased as a dedicated self-defense load. It’s not perfect but it’s very good. This round is suitable for use in any .357 and is known to reliably function in semi auto .357’s and lever actions both of which can often be finicky with loads. Q: What is the difference between a magnum round (or a 'special) and any other round? Is it the powder load? The answer to your question is "a combination of extra powder and extra marketing." There is no broad definition for what makes a magnum load. 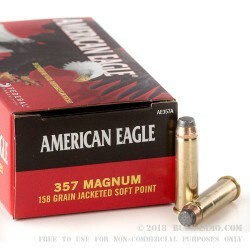 In most cases, "magnums" are existing cases that have been lengthened to become a new, more powerful case (for example, .38 Special becomes .357 Magnum). This is also true for .44 Magnum, which was developed from .44 Special. An oddity is the new .327 Federal Magnum, which was developed from a less powerful magnum, the .32 H&R Magnum, which was itself developed from .32 S&W. However, the reverse is sometimes the case. The .500 S&W Magnum was developed as a completely new cartridge, and the .500 S&W Special was developed several years later. To reiterate, while magnum cartridges have more power (and powder) than their smaller counterparts, there is no set definition for the term. Q: What is the difference between .357 Mag and .357 Sig? Can you use both in your .357 Marlin 1894C? A: .357 Magnum and .357 Sig are completely different rounds. Marlin 1894s will not fire .357 Sig. 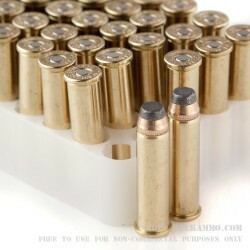 .357 Mag is a rimmed, straight wall cartridge, while .357 Sig is a rimless, bottleneck cartridge developed from the .40 S&W case. Thus, the .357 Sig case would be too wide to fit in the tubular magazine of the Marlin. Even if it did, it is not the same cartridge and should not be used interchangeably.